Another lens which almost every professional photographer in the world will have used. Built to last with terrific optical quality and superfast focusing, it’s hard to find much to criticise. It has only one fault really - it weighs about 3kg. It’s too heavy to weigh on my normal scales - the readout said ”EE” - which is pretty much what I say every time I pick it up, but quality always has a price and apart from the financial one, that’s the first thing that springs to mind about this lens - It’s .... heavy. You may notice in other tests that I permanently seem to be looking for the perfect 70-300 zoom to take on trips - That’s because, although I own this wonderful old lens, I wouldn’t want to carry it around all day unless I really need to. Something that delivers the same quality but weighs rather less, is always on my shopping list. This is very much a professional, built like a tank, no compromise piece of equipment, both optically and mechanically. My main worry when packing this for a trip is not that it will get damaged but that it will wipe out everything else in the bag! It’s a great lens, as I’m sure all other Nikon 300mm f2.8’s are so if you need one, go for it, but go along and check out the weight first. 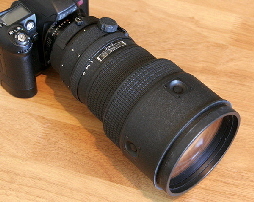 The 300mm f4 weighs 1500g less.